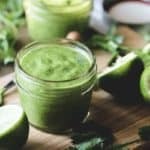 Cilantro Lime Vinaigrette... SO DELICIOUS! 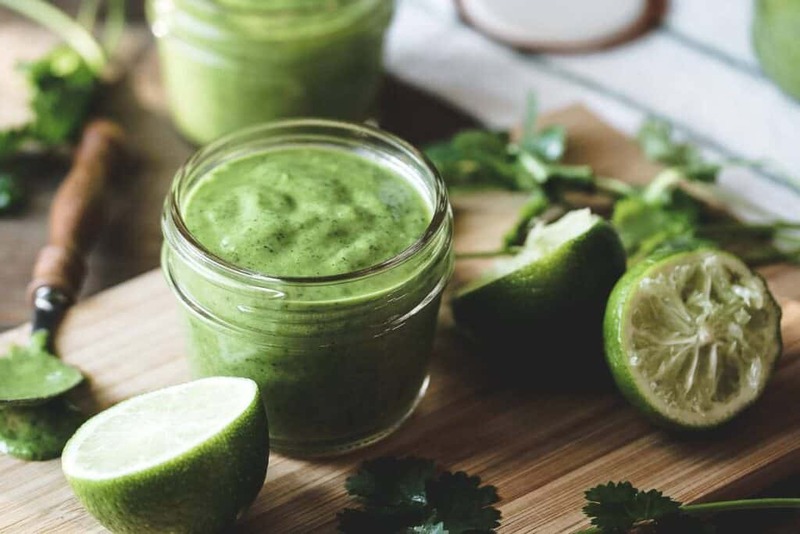 Cilantro Lime Vinaigrette. This is my favorite vinaigrette… ever. I mean it. Ever. I can’t help it. I literally could sit down and eat this with a spoon and be happy. I’m crazy for the combo of lime and cilantro. Lime and anything really, but this? Killer. I am SO happy I am not one of those people that thinks cilantro tastes like soap. That would be a major bummer. So sorry if that’s you! In an effort to make lunch time easier for myself, I’ve been picking a salad and prepping the ingredients on Sunday’s. 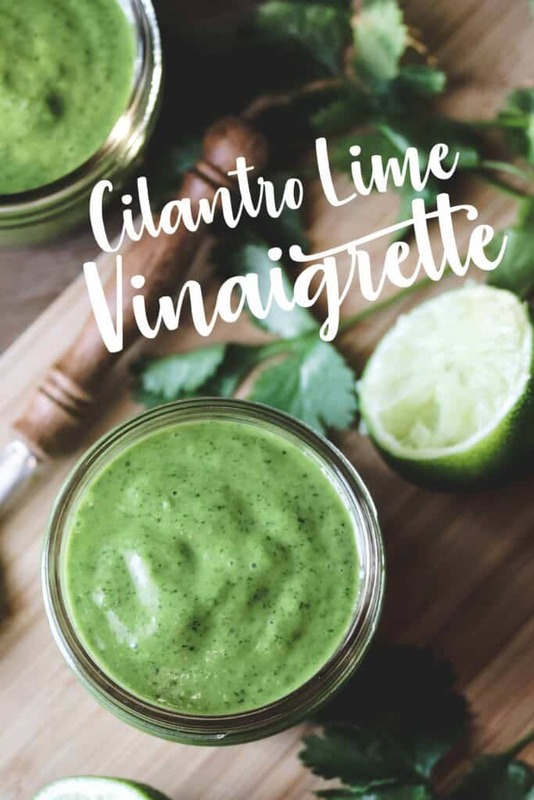 I make up this cilantro lime vinaigrette and at the same time prep all the salad ingredients I want to go with it. For this particular salad that usually means corn, black beans, diced bell pepper, green onion, and tortilla strips. Then I keep it all in the fridge ready to go. When lunch rolls around and I’m famished, all I have to do is throw the salad into a bowl, top with the cilantro lime vinaigrette, and eat. It makes healthy eating choices so much easier. If I don’t prep ahead I usually just end up eating dove dark chocolates all day which, while delicious, isn’t super nutritious. I made a version of this a while back but don’t go looking for that one ok? 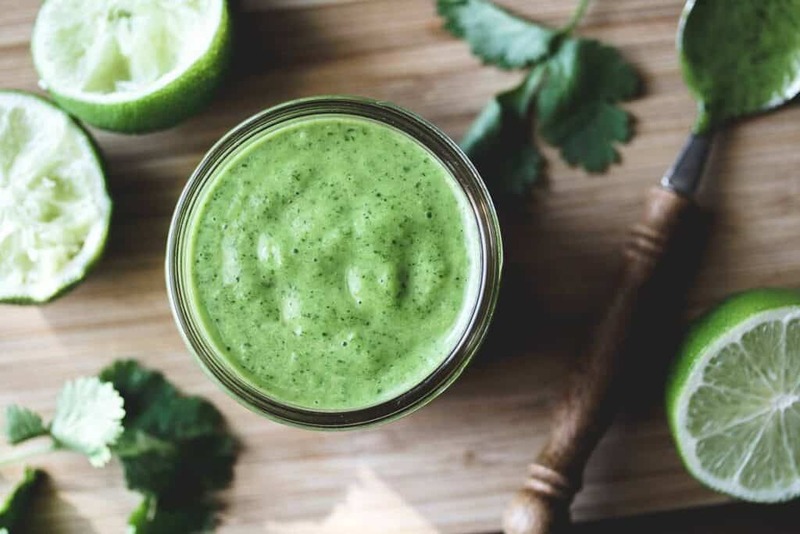 Let’s just stick with the ‘new and improved’ Cilantro Lime Vinaigrette. It’s got more cilantro, sweetened with honey, and a few more things to jazz it up. 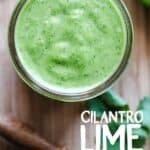 If you like cilantro, I know you’ll like this! Verdant, sweet, and tangy! Pure delicious! Place all ingredients, except for olive oil in blender or food processor. Blend on low or pulse until roughly chopped. With blender/processor on, slowly drizzle in the olive oil. Blend until combined. Serve immediately or chill until use. Shake before serving if the vinaigrette separates. Will keep in refrigerator for 5 days. Here’s another of my favorite salads. Great post. But a whole cup of cilantro kinda freaks me out. Lol. Tried it. And even though I’m not crazy about cilantro, it was really good, especially after a day in the frig.